Where Do You Put the Key? 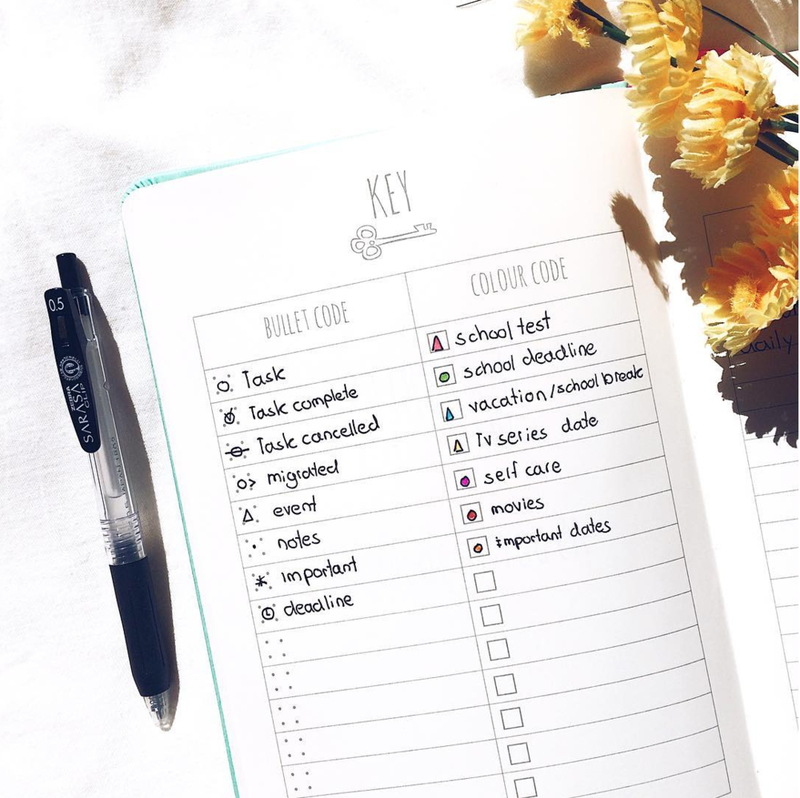 A bullet journal key or legend is simply a handy reference guide that you create to remind you what colors, letters, or symbols you use in your bullet journal to signify various tasks. If you are new to bullet journaling, you can learn more in this Beginner’s Guide. According to Ryder Carroll, the creator of the bullet journal, there are symbols he uses consistently on his bullet journal pages. If you haven’t used these symbols before, having a key on hand is really helpful. Carroll’s key includes the following symbols. You place them in front of each task, event, note, etc in your bullet journal for easy reference. You can learn more about each here. Use a “.” to create a task bullet for things you need to do. An “o” is to signify events. A “-” dash signifies notes. Add an “*” asterisk for next to a dot for important notes. When a task has been completed, turn the dot into an X. If you didn’t complete a task, turn the dot into a > and migrate it do the next day’s task list. If you didn’t complete a task and it doesn’t need to be done for several months, turn the dot into a < and migrate it to the future log. That way the task is in a safe place and won’t be forgotten. These symbols are really helpful, but you don’t need to stop there! Many people have taken Carroll’s original concept and adapted it to fit with their lives. Below are some examples of how you can alter or add symbols to make your bullet journal key work best for you. You key can includes a multitude of symbols or colors to suit your needs. For example, instead of having to write out every time you work out, just create a symbol that reminds you to workout (ie. a barbell, a sneaker, a lotus flower for yoga, etc…). By creating these symbols it allows you to make note of things quickly. Let’s say you are a student and you need to keep track of your homework assignments. So you could create a key that designates a color code for each class. When you are assigned homework, just highlight that homework and the due date in the appropriate color. That way you can easily look at your work and know what homework is due for each class and when it’s due. Or if you are a parent with three active kids, how do you keep track of everyone’s schedule? One friend of mine highlights each child’s schedule in a different color making it easy to see who has what and when. Make a list of things you want to be able to easily manage. What symbol would you use for each? Would you prefer to use colors instead of symbols? Once you work out these details, it will be easier to create your key. Check out the photos and videos below. They will give you lots of ideas on how to create your own key for the most productive you possible. Place your bullet journal key in an easy place to find. I suggest putting it at the front or back of your bullet journal for easy reference. Alternatively, you can create a key bookmark or flip out version. I’ll show you how to do both below. 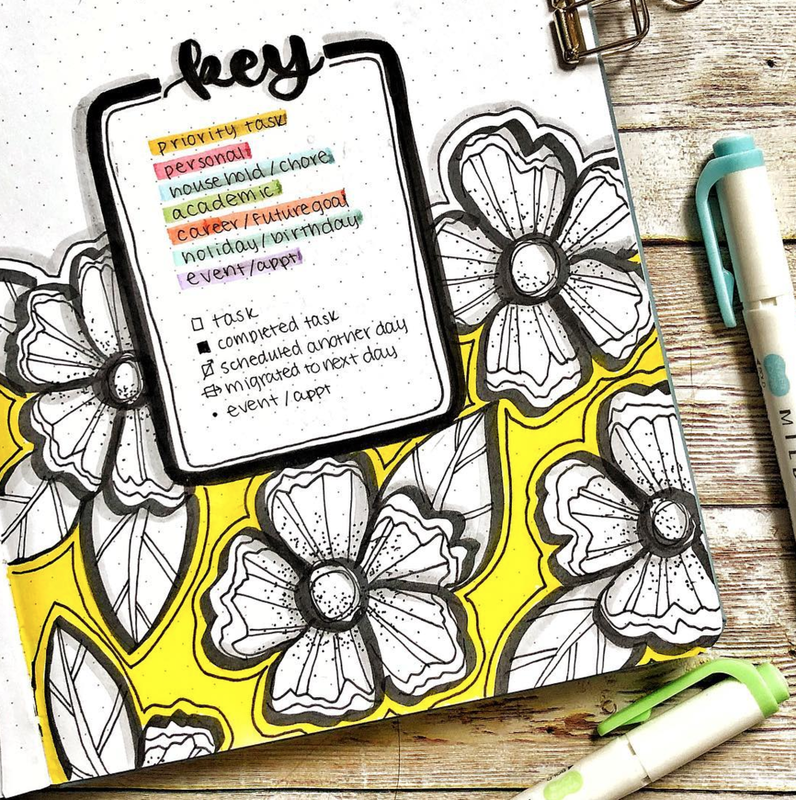 Create a key that uses all the symbols, colors, and tags you commonly use in your bullet journal. Your key is not defined by someone else. Create a key that works for your lifestyle. I’ve added lots of key ideas below so you can see how they change depending on someone’s needs, goals, and tasks. As I mentioned before, not all keys have to be the same. Create a key that works for you. Here are some key ideas to inspire creating your own. Diemmybujo key is obviously a student. Her key includes deadlines, notes, tests, vacations, school breaks, self care, movies, and tv series. Are you a student? List out some of the important things you want to be able to mark in your bullet journal. Wundertastichdesign created a bullet journal key is much more career oriented than the previous example. This key covers managing tasks, meetings, client work, online business, call, and Skype. In addition, it includes personal legend such as fitness, health, fun, Netflix, and accomplishments. Instead of using symbols, planningmindfully created a key geared around color. Top section includes color coded categories meant for time blocking such as sleep, get ready, miracle morning, exercise, work, relax, family time, planned event, social time, and chores. The bottom key is color coded for tracking emotions such as anger, envious, anxious, sad, and happy. Quexux.art created a three part key. The column on the left is focused on tasks and daily to-do management such as task, completed, canceled, migrated, event, appointment, deadline, notes, idea, inspiration, search, call, mail, and address. The column on the right is for symbols related to events or things to remember such as birthday, anniversary, travel, important, workout, social, home, sleep, question, university, goal, blog idea, payment, meeting, and concert. The last section was created to easily identify the days of the week by color. 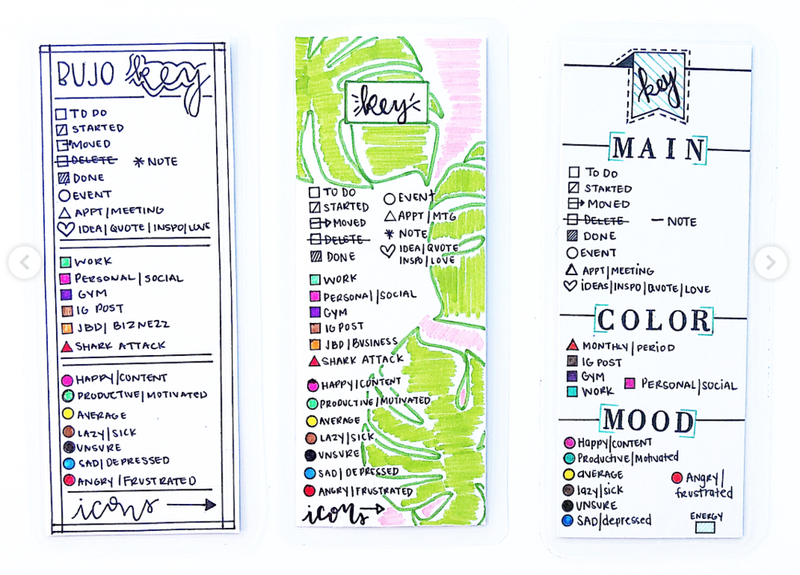 Artsybec bullet journal key used color coding to separate the various categories in her life. This is my favorite way to create a key! Journalbydesign makes bookmark keys for easy reference! She give three different designs to create a double sided key that is functional, too. She also has a really helpful step by step video that shows you how to make and use these bookmarks in your bullet journal. 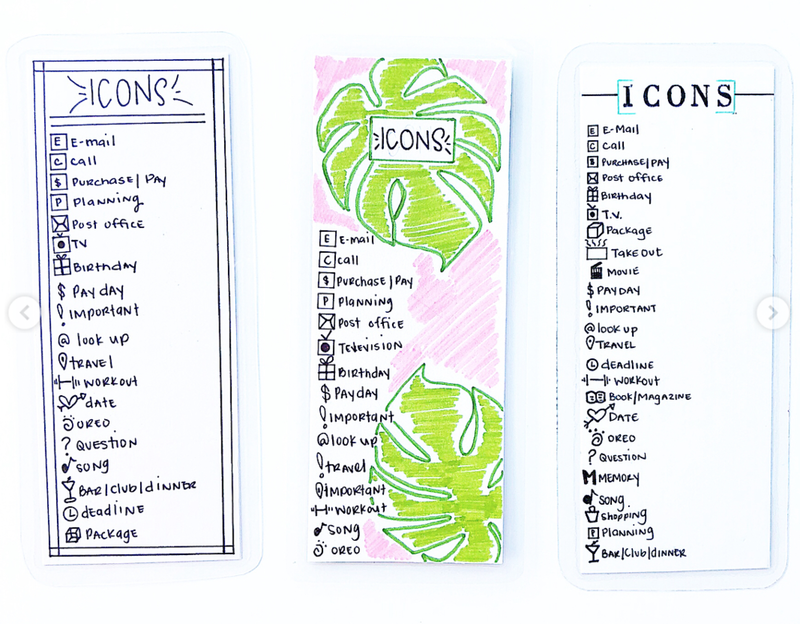 This beginner key from Sunshine Sticker shows you how to make a simple bujo legend. It’s a pretty standard layout with color coding for family members. Check it out! Petite Turquoise shows you how to create a bujo key for tasks as well as color coding for time blocking and moods. Want easy reference? Make a flip out key! It makes bullet journaling so easy because you can glance at the flip out at any time. Check out these how to videos from Bullet Journal Aholics and Sorted Soul. What if you love having a minimalist bullet journal? You can have a key, too! Check out this video on how to create a clean, sophisticated legend. If you want to see what materials I use for bullet journaling and creating keys, check out my Resource Page. I hope you create an amazing key for your bujo! I’d love to hear what worked for you. Let me know in the comments below.